The Kenya Revenue Authority (KRA) is the National Revenue Collection Agency for the Government of Kenya. Our Vision is: “To Facilitate Kenya’s Transformation through Innovative, Professional and Customer Focused Tax Administration”. Are you an unemployed Kenyan Youth aged between 20 and 34 years who has graduated within the last twelve (12) months i.e. not earlier than May 2017 with either a First degree, Diploma or Certificate from an accredited Institution in the following disciplines: Finance/Accounting, Economics, Supply Chain Management Studies, Human Resource Management, Marketing, ICT, Food Production, Food & Beverage Service, Housekeeping, Library & Information Sciences, Law (Kenya School of Law Diploma), Criminology and Security Studies, Business Administration, Business Management and Project Management? If yes then we invite you to visit https://erecruitment.kra.go.ke/registration to register and apply online for a six (6) months Internship program to start from 2nd July 2018 to 31 st December 2018. The program aims at providing the youth an opportunity for on-the job experience to build upon skills learned at school as well as for their professional development and, enhance their employability and is open within the non-revenue departments of KRA. 1. 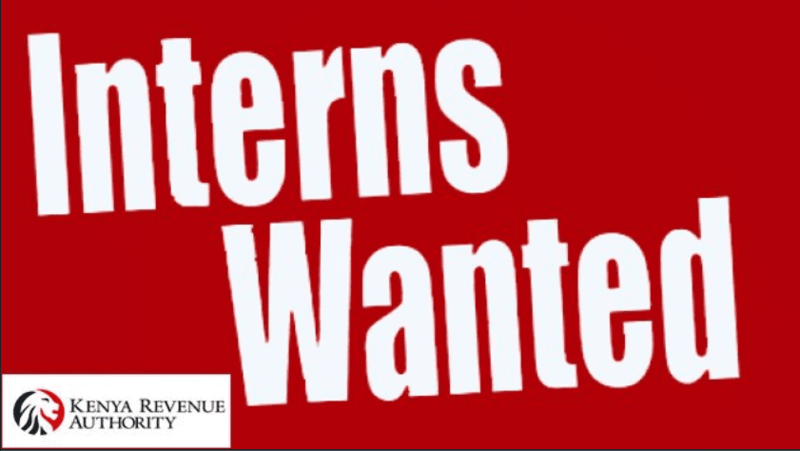 Not have undertaken any other internship programme or exposed to work experience since graduation. 2. Be Computer Literate and have strong communication skills. 3. Be a person of Integrity (Current Certificate of good Conduct required). • The deadline for application is 18th May 2018. • The Authority does not guarantee employment after completion of the Internship program. • Incomplete applications will not be considered. • No documents are required at the application stage. • Gender, Ethnicity, Disability and Regional balance considerations will be applied in the selection process. • Only those shortlisted will be contacted. • The Authority does not charge any fee for this process. 1. Click on https://erecruitment.kra.go.ke/registration to register. 1. After registration click on https://erecruitment.kra.go.ke/login. 2. Key in your username and password then click on Log in to access your account. 3. After successful login, the system will open the ‘Applicant Cockpit’ which has two tabs; Candidate Profile and Employment Opportunities. did you select the interns? What about the internship for 2019?